Visual novels can be very hit-and-miss at times. Without the right story and dialogue married to the correct balance of interactivity from the player, they can too often descend into dull melodramas where player agency is reduced to skipping through an endless stream of cutscenes. So when the very first Ace Attorney confidently strode onto Game Boy Advance in 2001, it took the limited scope of the genre and used your involvement to create a fun and exciting courtroom adventure that spawned two equally brilliant sequels. And while the Ace Attorney series has found its quality levels fall and rise over the years in the spin-offs that followed, the original Phoenix Wright: Ace Attorney Trilogy remains the franchise’s absolute pinnacle. All three sit among some of the best games to ever grace Game Boy Advance and Nintendo DS (which they were ported to for their Western release, starting in 2005), selling over 6.7 million copies worldwide, and now they’ve been tarted up and optimised for another successful Nintendo platform. If you’re completely new to the series then we envy you; you’ve now got the chance to experience probably the best set of visual novels outside of the Zero Escape and Danganronpa games. Combining Phoenix Wright: Ace Attorney, Phoenix Wright: Ace Attorney - Justice For All and Phoenix Wright: Ace Attorney - Trials and Tribulations, this trio of courtroom dramas follows the legal career of the titular lawyer as he takes on a series of increasingly difficult and often purposefully convoluted cases. 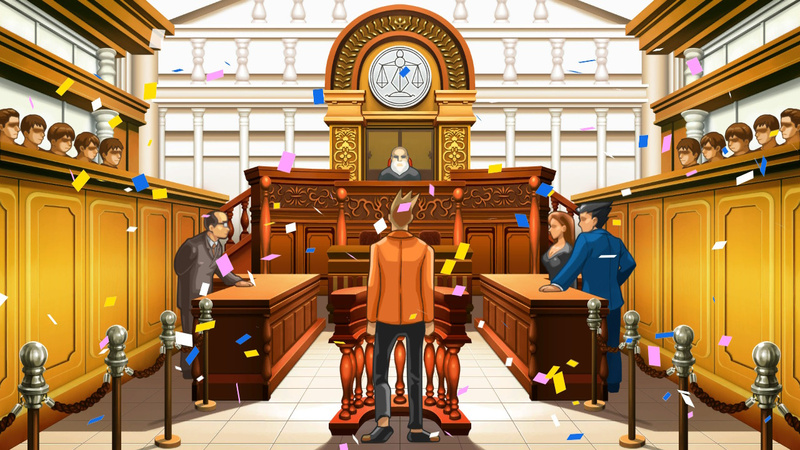 All three games split their action between crime scene investigations – where you’ll examine elements on-screen point and click-style in order to gather evidence and context – and courtroom-based exchanges. The latter serves as the bulk of each game and, rather conveniently, presents the most rewarding and enjoyable experience. Here you’ll be presented with the accused and a series of witnesses. As a plucky defence attorney, you’ll listen to the testimonies of each one then compare to the evidence that’s been presented to the court. By performing cross-examinations of these testimonies you’ll then have the option to ‘press’ the witness or defendant to find inaccuracies or intentionally withheld details and ‘present’ evidence that potentially contradicts their statements. So yes, it’s 'Law & Order: The Video Game', but what sets those first three Ace Attorney games apart from those that followed is creator Shu Takumi’s excellent writing. Each case finds the right balance between classic anime theatrics, disturbing crime details and moments of heartfelt levity, and while some cases really double down into that grey area where ‘good’ and ‘bad’ are blurred, its logic helps you develop a gut feeling of who to believe and who to disprove. In-between courtroom sessions you’ll be out and about conducting investigations, inspecting locations for clues, collecting information for the Court Record and interrogating suspects, witnesses and more. You even get the special case added to the DS version of the original Ace Attorney, which introduced the ability to inspect evidence more closely. Both Justice For All and Trials And Tribulations are included in full, and they’re both still a riot to play, while Justice For All’s frustratingly short length feels like less of an issue now it’s been packaged together with the rest of the trilogy. 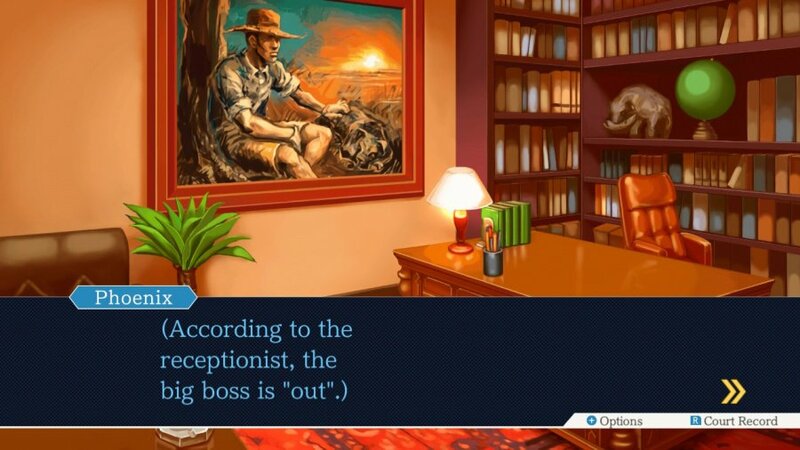 The Ace Attorney series has been ported plenty of times already, so it was only a matter of time before Mr Wright made his way to Switch. Thankfully, these new versions have fared far better than the ones that popped up on Wii, with enough optimisation – including resizing and cleaning up every frame to make them look better than ever both in docked mode and in handheld/TV modes. HD Rumble helps give those shaky moments of exclamation – including Wright’s classic lines, naturally – that extra bit of vibrating heft. 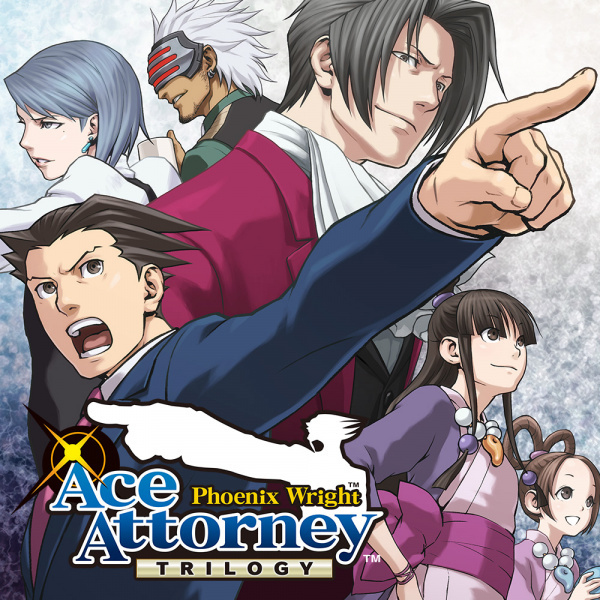 For longtime fans, Ace Attorney on Switch doesn’t bring anything new to the mix per se bar some touched up graphics, and despite the lack of features introduced in later games – such as the ability to spot tells and ticks when looking for lies and a greater emphasis on crime scene and investigation details – all three are still brilliant examples of how a game series can be both instantly enjoyable for new players and deep enough for returning sleuths. 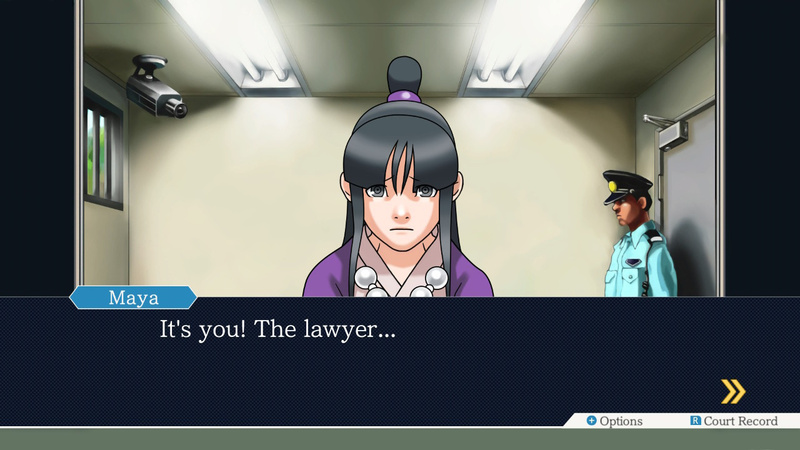 Sure, the lovely 3D character models of Phoenix Wright: Ace Attorney - Dual Destinies are certainly easier on the eye, but the 2D animations seen here still pop off the screen with plenty of character in 2019. The original Ace Attorney is – dare we say it – almost 20 years old, which is remarkable when you consider just how well it holds up 2019. Sure, it’s been ported plenty of times and the jump to Nintendo DS certainly helped shake off the retro cobwebs, but as a piece of interactive history, Phoenix Wright: Ace Attorney Trilogy is as utterly addictive and truly rewarding as it was back at the turn of the millennium. Whether you’re brand new to the world of virtual defence law or a veteran attorney, Phoenix Wright’s first adventures are still a fine set of cases to undertake. Wait, so Phoenix Wright isn't an old fashioned flight simulator? I bought the Japanese release way before the western one but its been sitting in my backlog since. I'll probably start playing it once I finish Stein;s Gate Elite - which is the best VN I have ever played! Cant wait to finally see what these are like when my Japanese import arrives. What is it with Capcom and skipping on physical releases in the West? OBJECTION! Score could be a little bit higher. Ace Attorney series has been an inspiration to me since the days I first played the trilogy. With Phoenix Wright’s Nintendo first exclusivities over the years and the fact that he was in a fighting game, which is UMVC3, it gives me a good idea to consider giving the good Ace Attorney a Smash invite. This should have been a 10. I originally bought this trilogy on the 3DS quite a few years back, but I think I will end up double dipping if the sale is good enough. This is a perfect 10 trilogy. It has good value, but already bought it on 3DS, so not going to spend money on this. You get to cross examine the parrot of a murder suspect. I have an acquaintance who keeps nagging me to try this series. It's still committed to my "soon" category, but I DO intend to play these at some point. XD He was right about the Professor Layton franchise at any rate. @cacnea310: If I may ask, where did you order this? I'm considering importing a couple of games in the future (including this) but have never done so before. Here’s my dilemma over buying this; I’ve got a very good memory and it can ruin games. I’ve only played the first one, and loved it, but am pretty sure the replay value is shot. It’s the same reason I can’t enjoy Heavy Rain or LA Noire years after release. I blame my parents; you can only see so much Matlock and Murder, She Wrote before turning into Shaun Spencer. The gameplay isn’t that great, the visuals aren’t too impressive but the amazing story and soundtrack MORE than make up for it. A must-play for anyone who likes story-driven games! My main reason why I wanted a DS back in the day. One of my favorite franchises from Capcom. @Tyranexx I’ve ordered mine from Play Asia. I’ve had really good packaging quality from them before, although their shipping and import costs add up to be quite expensive in my experience. I’d recommend bulk ordering to save money if you can. Also, if there’s a preorder in your order, I’m pretty sure you can set it so everything ships when it does. Although I did read, and I’m not sure whether this is correct or not, that they don’t hold orders in these situations, so if everything in your order only ships when your last preorder releases, some of those orders may have already sold out, and thus wouldn’t be included. I’ve never tried this though. Amazon.co.jp is another option, I think they either have global shipping or almost global shipping too. I wish for a translation of any recent entry of this franchise, like Dai Gyakuten Saiban 1 or 2, not the 20 years old game' port. @AlohaPizzaJack Then you should wait for a sale/price cut next year (which is a given). Definitely get this version though, as it not only includes Japanese but will also get the French and Chinese language patch soon. Who knows, maybe you'll be interested in learning another language in the future? Absolutely loved these games on the original DS. Highly recommended! I barely remember the stories so I’ll be revisiting the series soon. I'd love it if they rereleased Apollo Justice, the 3DS games, and Miles Edgeworth Investigations as well. I haven't gotten to try those, yet. @HADAA Yeah, that’s what I’m leaning towards. I can play it in French and Spanish for sure! Unfortunately I've played the original trilogy a few times so I can't justify the purchase. But for new comers or anyone who's intrigued and enjoy ls a well thought out story and memorable characters then this is a must buy. So satisfying to go to court and find the contradictions in statements and that music is just wonderful. Also plenty of twists and the connection and story arch's over all three Games is so well done it might as well be one huge game alone. I'm looking forward to trying this next month. Got the trilogy in HD on my iPhone when it went on sale - so I am good. But still great to see. Ace Attorney: Spirit of Justice is also available in HD on iOS if you want to keep the fun on the GO after these. It is a thing of beauty on an iPad. How long roughly do each of these take to finish? Are we talking a couple of hours each, and the ability to finish it in one session? Or are they longer, more involved affairs? Nothing less than a 10 is an acceptable score for the Ace Attorney Trilogy, no matter how many times it's ported. @Bondi_Surfer I think my playtime for Trilogy on 3DS was about 75 hours to get through all three if I recall. They're reasonably lengthy games. it is good to have this not only on the go, but to play on the tv as well. it is so good to have a hybrid system. I’m a newcomer to these games. I bought the Japanese cartridge and played through the first game. It took me about 25 hours. I wish they would add some quality of life updates. When you’re trying to present a few different pieces of evidence and every time you have to tap through the same lengthy conversation it can get old quickly. I like the story, but playing can be a bit of a chore at times. I’m going to wait a couple months to come back for the 2nd one. I also agree that the AA Trilogy are pure 10/10 games, not many games i think deserve that score, but these absolutely do, i adore this series so much and i can't wait to see what the first new game in the series will be like on the Switch. I absolutely love these games. Definitely picking this up. Anyone with other good visual novel recommendations for switch? Naughty! Broke the review embargo with this! @Toshiro_Baloney Can't go wrong with Steins;Gate Elite. @Sabrewing Oh I didn’t know this was on the system! Thank you! I will give it a go too. @Toadie I love these games too, but I don’t think they are exactly perfectly executed. Given the premise I wished they allowed for multiple ways to solve these cases. Sometimes I had a metaphorical smoking gun that I could have used as evidence, but the game only wants you to make choices and present evidence in the way it intended. I think 8/10 is fair because this aspect of the game didn’t age that well. I remember NintendoLife giving the WiiWare versions being rated 5/10 for being simple ports of the DS game but then they give a simple port of the 3DS trilogy to Switch an 8/10. 5/10 for Ace Attorney still strikes me as being inherently wrong. It was the first time I played the games and they were amazing to me. I'm gonna have to ask for an adjournment as I only recently got this on 3DS. @Bass_X0 To be fair, they were rather badly done WiiWare ports. Anyway, I highly recommend the series if you've yet to try it out, but I've already got the trilogy on 3DS, so I'll pass. One of the best gaming experiences ever. 10/10 for overall enjoyment. Heck I just decided to purchase these games for the second time. The Ace Attorney games are among my favourite games. The Trilogy is an easy 10 in my book. Fantastic soundtrack, great story and full of humor. I think 8 is about right. They have been around for quite a while now and although the HD upgrade is welcome it isn't that big an advantage given the art style and gameplay. The stories are great and later on totally bonkers. There are some issues with the logic in the cases as they get more complex and the evidence you have to present does turn out to be unnecessarily obscure at times with other perfectly reasonable options losing you a life/health bar. They are definitely worth a play and as I have only played two of these three I will get it again. I'd like them to put the Apollo justice game out and even the Miles Edgworth games too. Maybe as DLC packs for this collection? I hope we get a Professor Layton Collection next! You had me with the special case from the original DS release being included!! I REALLY want Capcom to also make a Miles Edgeworth investigations HD collection. Those games deserve a bigger audience! Objection! No voice recognition for this one. @BANJO You can import the Japanese version. It's only like $10 more than the digital version, including shipping. @Krambo42 Thanks, I might do that. For that price it's worth it. I've never played any of these games, so all I'm gonna say is eat your hamburgers, Apollo. These are three of my favorite games of all time. Absolutely love the Ace Attorney series. I hope a 4-6 collection, an Investigations collection (with 2 localized) and heck, maybe even a localized Great Ace Attorney collection are next. Then some new stuff, of course! 8? Bah. This is about the easiest 10/10 there is. @BANJO Yeah, I don't even particularly care for physical games, and I imported it just because I'm a huge AA fan and I couldn't wait the extra few weeks for it to hit the US eshop, ha. Fully playable in English, nice cover art...yeah, it's awesome. @Krambo42 I might look to order it tonight In that case. Thanks for the info!! @AlohaPizzaJack I'd say it's worth the price to play the 2:nd and 3:rd game so def buy it. If you thought the finale in the first game was good then you have A LOT more of that coming. Great series! It is tough to double or triple dip though on this as the games all have the same linear conclusions with no alternate endings. I remember Phoenx Wright 1 being the most expensive DS game I ever bought (imported it from Sweden as the German version was delayed more than a year due to localization issues). And here we are with the whole trilogy combined, in HD, for just a fraction of the price. What a great deal... well, if only it was physical here (then I wouldn't be able to skip it). @cacnea310: Thanks for your informative reply! I'm considering Play Asia for now but may use Amazon Japan in the future. I'm not normally one to bulk order games, but I can definitely see how that would be beneficial in this case. @BulbasaurusRex they were still good on wiiware. I chose to use the button controls and not the optional Wii remote swinging controls. The story was still the same, the gameplay was still the same, the graphics were still the same. It was several years before the HD remake. @Bass_X0 The graphics were terrible. They used the GBA graphics instead of the DS graphics and then made them even worse by not properly optimizing them for the larger screen. Meanwhile, the Wii specific features were poorly implemented and then weren't implemented when they should've been. Sure, you could use button controls, but that only underscored the fact that the DS versions were much better, especially where Case 1-5 is concerned (which shouldn't have been DLC in the first place). First time I played these games was on the Wii as well and I loved them. In fact, I enjoyed them so much I've bought this release for Switch because like a moron I sold my original Wii years ago and with it lost some of my favorite games of all-time. Happy to be able to get these back. Hope maybe some more WiiWare games from the past can resurface on this machine.